Ah, there's nothing like sitting at the kids' table on Christmas Eve. Such well behaved little angels. Ha! I tried to make it cute, dressed the table up just for them with matching glasses and decorations and place cards. And still, it was a race to eat as quickly as possible and be excused from the table. But not before pelting the little plastic snowflake confetti at each other. Because you know it wouldn't be Christmas Eve dinner without a little mischief and one small temper tantrum (Little Miss Y). One day we will miss this right? Oh and this beauty of a picture right up here? This will end up in one of the boys' wedding videos for sure. I'll make a point of it. Just looking at it makes me laugh out loud and hum "you've got a friend in me". Hmm... I think that might be a page. A cheesy little grin after opening the much coveted Phineas and Ferb guitar. One of the top 3 items on his list. Happy like a 5-year-old on Christmas morning. There is nothing better than that! I love them all, but I think they made Hometown Summer and Daily Junque just for me! ;) Wish me luck on my very first manufacturer's design team. I think it's going to be fun! With just 5 more days to go, my little pip is trying so very hard to be on his best behavior. Last week, I caught him having a conversation with the smoke detector in his room (he thinks it's a Santa Cam, but that's another story). He was pleading his case for being on the nice list while I listened just outside the door and tried not to laugh. 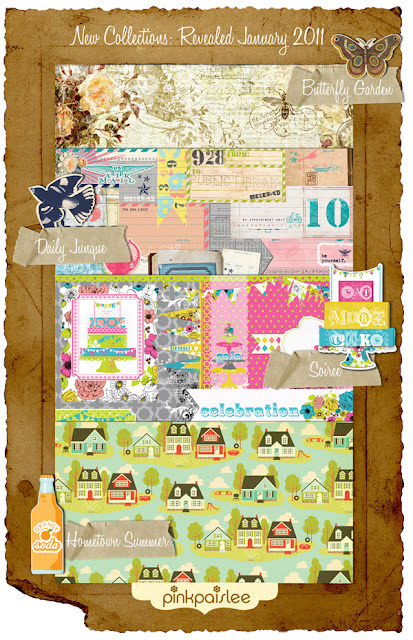 This layout was made for Right at Home Scrapbooking. When I came across this 'Nice or Naughty' list paper, I knew I had to do this page. You see Nico's behavior is either very nice or very naughty, there is no in between with him. Last year we had a running checklist with nice and naughty days and he very barely made it on that nice list. This year we didn't do the checklist because I figured I was never going to allow him to be fully on the naughty list or suffer those consequences, so why even do it. Thank goodness that turning five has made a world of difference and Nico finds himself having many many more nice days. The stubborn streak and bossiness are still very much there, but he has learned to reign it in and let Mom be the boss. Here's to another year of Nico the Nice! Just 7 short days left....are you ready? I've been wrapping gifts like a madwoman, I'm just about DONE! I had a tiny bit of time for a scrappy project and so I sat down and made this photo tag. I used the White Christmas line by We'R Memory Keepers (paper, chipboard & glitter lace) and some raw chipboard that Right at Home sent me. 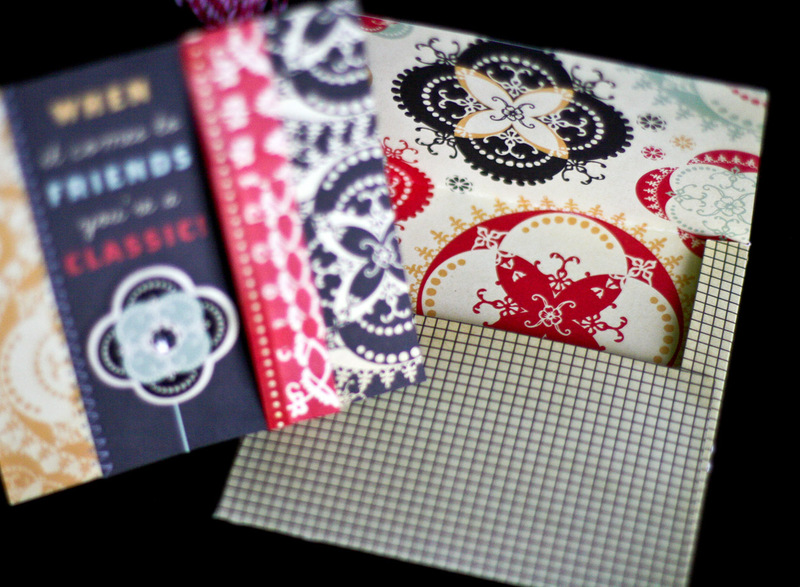 I ran a sheet of white cardstock through my Cuttlebug using the Seeing Spots embossing folder. 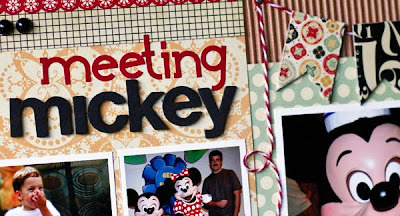 I layered together one of my favorite holiday photos, all of the paper and chipboard, added some sewing, twine and voila - one photo tag in 20 minutes. Not bad! I think I just might make a few more and add them to some of my wrapped gifts instead of traditional name tags. I think the kids would get a kick out of finding their "faces". I guess its back to wrapping for me! I have a new Cricut cartridge sneak peek to share with you! I received the Best of Pixar cartridge and I'm in love. Designing for the Cricut Circle has been a dream assignment for me. I have a great team to work with and then every once in a while a cart like this arrives on my doorstep. For a Disney freak like me, it's heaven! There are tons of images of Nemo, Flik, The Incredibles and Monsters, Inc on the cart. 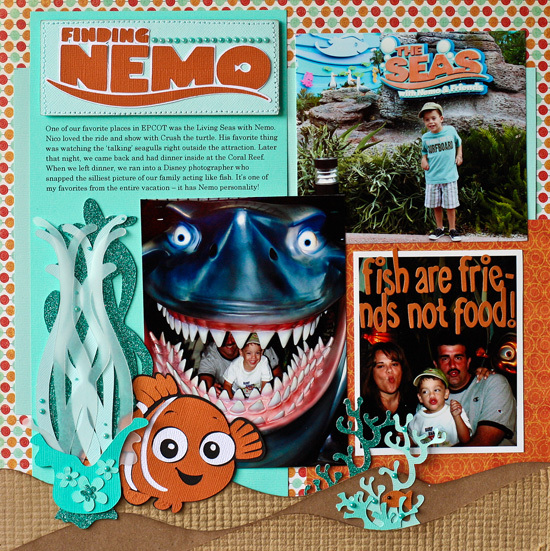 I love this collection of Disney pictures from our trip, so I decided to use the Nemo title, anemone, coral reef, flowers and sand bar to put together this page. There are 9 other brand new Cricut carts and you should see different projects from each of the circle designers go up throughout the day. And for the Disney folks, there is a Classic Disney cart with Alice in Wonderland, Peter Pan, Pinocchio and Bambi. You will love it! I hate to post and run, but I have 30 gifts to wrap before Nico gets home from school. They're not all for him, but he can't be around because I've discovered that the little stinker cannot keep a secret for beans! This is my first Christmas page of the season. 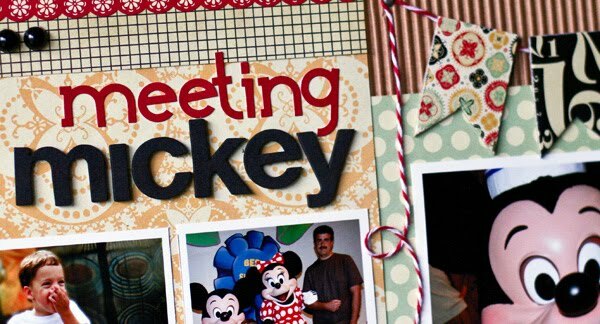 I usually take hundreds of photos of what we do and where we go during Christmas time, but I rarely get around to scrapbooking them. Once I take the tree down, I'm done and I don't want to see any more Christmas related things for the rest of the year. And so I have years and years of layouts that I really need to do. I started with a tradition that Nico and I have had for years. I've been reading 'Twas the Night Before Christmas to him since he was just a few months old. He's always loved the story and illustrations in the book. This was the first year that he picked it up and attempted it to read it himself. I took these pics recently and I knew right away that I need to scrapbook them. This layout was made with the December Work in Progress kit. I combined the Cosmo Cricket Circa 1934 line (again) and Pink Paislee's Father Christmas. The light blues in these lines match really well. I love the little border of text with a line from the story. Thank you Pink Paislee for making that - it's perfect! I created the banner for the journaling out of grid paper and rolled it up at the top. It reminds me of the "checking it twice" list that Santa makes. The title came together quickly with some weathered wood letters by Pink Paislee and glittered alphas from the Dear Lizzy collection. All of the paper is Cosmo Cricket. Thanks for stopping by! I'll be back soon with a few more Christmas projects and sneak peeks. I usually shy away from the frou-frou look. I like it, but I do ugly things with it. I think I have a natural tendency towards clean lines and that usually doesn't work with the fancier styles. This Circa 1934 line by Cosmo Cricket has a mixture of both ornate and bold patterns which I really like. These photos are from Nico's baptism. That's my Dad and grandmother holding him. I love the look of pride and happiness on her face. I remember her telling me that she was so grateful that she got to live long enough to meet her great-grandchild. Looking at these pictures is bittersweet because I can clearly see how rapidly Nico has aged and how quickly she is fading. Her wish was to meet him and mine is for her to live just a few more years so that he can remember her. This page was created with the December WIP Kit. This layout started with the circle chipboard embellishment and the polka dot paper. 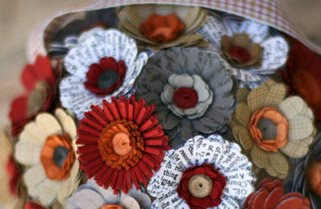 I loved both and tied the circular theme together with the black patterned paper. I cut a long strip of the "tag" paper and placed my title, date and small photo on it. This was a fairly quick and easy page to put together. I think the colors and patterns dress it up without having to add much. So that's it, my one frou page - which actually is not very frou is it? I guess it's the feel of it more than anything. I'll be back tomorrow with the last Circa page - my first Christmas page of the season! As you have probably already noticed, I love doing Disney layouts. I love the bright colors and the pictures from those vacations are some of my favorites. They show Nico at his happiest and these are the memories I like to document first. This page was made with the December WIP Kit. I used corrugated paper for the base of the page to add texture and tone down the vintage look of the patterned paper. The twine was glued down in random loops using Zip Dry Paper Glue - it dries perfectly clear! This was a fun layout to make - I can't believe how little Nico looks in these pictures. I have a whole notebook full of Disney stories, so be prepared for more layouts! And for variety, a simple card. I am so not a card maker - I think that's a whole other crafting skill. I have a hard time working on such a small canvas, so I kept it very clean using 3 strips of patterned paper and one chipboard embellishment. For texture, I folded the red paper into a ruffle and added some sewing. My favorite part of the card is the coordinating envelope. I'm a total matchy-matchy girl so this is right up my alley. I love how the double-sided patterned paper gives me an instant envelope liner. 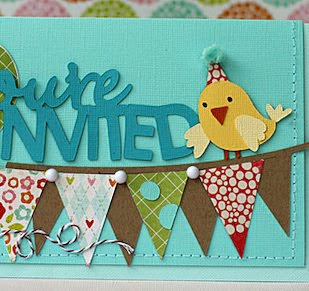 I created both the card base and envelope using the Wild Card Cricut cartridge. I'll have two more Cosmo Cricket Circa 1934 pages up tomorrow. Thanks for stopping by! Goodbye Thanksgiving and hello Christmas! Today is a "back to the routine" day and while I love my boys (the little one and the big one) it sure is nice to have the house back to myself. I'll spend a quiet day decorating , but before I do that I thought I'd pop on and do a little post-Thanksgiving review. First up, is a shot from Nico's Thanksgiving Play. There's nothing like hearing those tiny little voices sing and put on a skit. I tear up every single time. There's my little Andrea Bocelli in the back (with the blue jeans) singing his heart out. Actually, I'm pretty sure he was screaming at that point - in direct competition with his buddy right in front of him. And here's the little ham with his teachers, Miss Ann and Miss Emmy. Two of the best teachers he's had yet. He loves going to school and I think these two ladies have a lot to do with that. I'm very grateful for them. Last up is the ONLY picture I took on Thanksgiving, just minutes before everyone left. Every year I say I'm going to take more pictures and every year I am so completely overwhelmed with what it takes to serve 25+ guests, that I take no pictures. One day I'm going to regret that - I know! These little faces up here is what I'm most thankful for. They are the heart of our family and we are blessed to have each and every one of them! It's been a while, I know! I've been busy making stuff, cooking stuff and organizing stuff. I'm getting ready for the big Thanksgiving dinner tomorrow and I just took a few minutes to post some of the things I've been working on. I've been dying to use this Alphabet Soup line by My Mind's Eye. I love the colors and the flash cards. I've had them sitting around for a while and I was so happy to finally use them. When I first went through the deck of cards, I saw this fish flashcard and that prompted this page about Nico and his first swimming lessons. There's a little bit of everything on this layout - all of the paper is MME, the clear buttons are 7Gypsies (super old), letters are Pink Paislee and the "school" tab is Crate. Oh and I started to use some of my new twine...love it! and then a little sneak of a Cricut Circle project I did last month....love the Birthday Bash cartridge - it's one of my favorites right now. Notice that I'm on a serious twine and banner kick right now. The aqua of course, remains consistent. Ha! So I hope you don't find the sneak peeks annoying. These are some of the projects I've been working on that keep me from blogging regularly, so I thought I'd share what I can. The good news is....all of the Work in Progress pages will be up next week. The bad news is...I have to get back to making my lasagna. Yes, we have lasagna for Thanksgiving...and turkey...and Spanish rice...and 3 different types of potatoes. It's like a meeting of the United Nations around here tomorrow. I'll be back with pics! We had such a great time trick-or-treating this year. The kids are finally old enough to walk around the neighborhood without being pulled in a wagon. They ran me ragged going from one house to another, the entire time reminding them not to step all over our neighbors' landscaping, don't touch the decorations, say thank you and Happy Halloween. I repeated that 100 times in the span of an hour. Ah, the joys of parenting. Ha! I used the Halloween line by Echo Park and I love the bold colors and icons. I think it's just "kid" enough for these pictures and story. I love the picture of me with my little Tinkerbell. She held my hand the entire time and told me I was her best friend...warms my heart that little one. She is the daughter I will never have and I adore her to bits. I used my brand new Thickers for the title, a frame from Little Yellow Bicycle and Flair from American Crafts. And there you have it - one quick Halloween page! My favorite parade and place to be on Halloween....Disneyworld! Just a few pictures from our first trip to Mickey's Not So Scary Halloween Party in 2008. We had great seats right near the castle and I love how some of these pictures turned out. Click on picture to view larger. Sorry I have no detail shots this time! I used the Hocus Pocus line from Pink Paislee. I think it fit the theme perfectly...regal and bright and colorful all at the same time. I think that's hard to do and Pink Paislee seems to do that perfectly every time. Just thought I'd share a quick find with you. Look what I came across today in my searches. 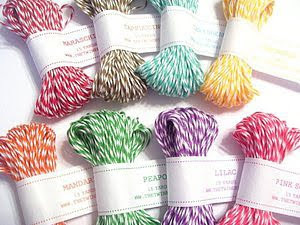 Beautiful, glorious, colorful twine. I'm in love. I see many, many twine projects in my near future. You can find a sample pack here for $14. I think that's pretty cheap for 15 yards of each color considering I paid $4 for the tiny Martha Stewart ones. Have a great weekend, I'll be back Monday with that Halloween page. Did you ever have a seemingly insignificant moment in the past that you remember vividly? Almost like your mind took a snapshot of it. I love you Restoration by Crate Paper, I really do. I wasn't going to buy it because I have so many lines of paper already and it's a little on the frou-frou side. But the colors, oh those bold colors finally got me. I kept picking it up on a recent shopping trip and when I saw the bicycle, I immediately thought 'Sanibel'. I had to have it and I'm glad that it came home with me. This is a really simple layout, just some layers of paper and chipboard. The chipboard filmstrip I picked up in a store in Massachusetts recently. They were in a bin and I picked up a bunch but unfortunately I don't know who makes them. I was very inspired by this layout made by Michelle Lanning - one of my very favorite scrappers ever. No one does layering like this girl. You can see where I got the idea to double up the stamp-edged paper from! First up, the boy won! He came in 2nd place in our neighborhood costume competition. He was so happy and proud. The day before he won a blue ribbon in our town's costume competition. Probably because he was the only NASA astronaut I saw all weekend. Ha! Then I had my some of my favorite kids in the whole world over all day on Halloween (love that!). And this house in our neighborhood is just...amazing. Every year they do an over the top theme and this year it was Camelot, complete with castle facade, real knights in shining armor, and themed music. There is no way a picture could do this justice. There were police cars and 200 people on the sidewalk, so it was impossible! I love that these folks do this...it's one of Nico's favorite things to do on Halloween now. And so that's it...1 astronaut, 2 costume competitions, 3 parades, 4 cousins to spend Halloween Day with and 5 parties. How's that for Halloween by the numbers?